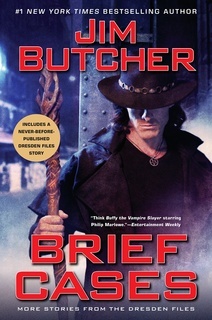 This is a collection of Harry Dresden short stories, collected into one volume. Usually the stories are part of a science-fiction-fantasy anthology written by many authors, of which a Dresden will be one of many in the book. I used to buy these anthologies for the Dresden story, until I realize if I wait long enough, a compendium of Dresden shorts will be assembled and published, and THAT was what I really wanted. I had read many of these short stories before, mostly in the Big Foot collection. There were, however, a few I hadn't read. I enjoyed the Molly tales, especially the one where she earned her svartalf apartment. Molly's thinking voice, however, while a bit too male, and a lot too Dresden, is still quite enjoyable to read. The book is a must for any Dresden fan, and would make little sense to anyone else. And pretty sure I missed a bunch of my highlighted quotes, what, reading on a broken kindle and such. Carlos squinted his eyes and studied the bartender, as if weighing the value of heeding her words versus the personal pleasure he would take in being contrary. Harry Dresden has had a horrible influence on far too many people, and has much to answer for. “Knights of the Cross never have any missions they question?” Carlos asked. “Once we get these kids clear, I want to kiss you again.” My tummy did a little happy cartwheel, and my heart sped up to keep it company. But, again, when casting a wizard as the central character, from a storytelling standpoint all of that power is a liability, not an asset. Protagonists have to be challenged, struggle, and grow, not just mow down everything that gets in their way with their Tenser’s Mystic Inflammable Bulldozer spell. And yet, this is exactly what Butcher did to Dresden. I didn’t think I’d had much out on the island, but it’s amazing how many boxes it takes to hold not much. I glanced at the clock as I filed out with the rest of the jury. Nine tomorrow morning. That gave me just under sixteen hours to do what wizards do best. I left, and began meddling. I really enjoyed this story, told three times in three parts from Dresden's, Maggie's, and Mouse's perspectives. My instincts frequently roll their eyes at the decisions my brain makes. He didn’t talk to me in a kid voice, like some grown-ups did. They sound different when they talk to children. My dad sounded like he did when he talked to anyone else. Learned this one the hard way when I talked to Kim Wasson's girl, Ceili. Don't. Talk. Down. Talk with. But feeling true isn’t the same as being true. In fact, feelings don’t have very much to do with the truth at all. Nothing is truly safe in this world — and that being the case, why worry about threats that have not yet appeared? That might be the saddest part of human heart-stupidity: how much happiness you simply leave aside so that you have enough time to worry.